Geri-Fit's Online Caregiver Training course is ideal for family caregivers and home health aides that want to learn the evidence-based strength training exercises that can be used to rebuild strength that's naturally lost through the aging process, or from chronic disease, stroke, or other medical conditions. These exercises are specifically designed for the needs of older adults that are age 75 and over, however, any age can benefit by them. • Learn evidence-based exercises and stretches that are appropriate for the older adult population. • Recognize the physiological changes that occur with aging. • Identify when to substitute or modify a strength training exercise based on a person's physical limitations or joint replacement. • Adhere to safety and injury prevention by using recognized industry standards. During this condensed online course, you'll learn 25 evidence-based strength training exercises and stretches designed to improve function, strength and range of motion. No equipment is needed other than a pair of light dumbbell weights and a stretch band. Sample videos of strength training exercises for the upper and lower body will also be provided as well as one-on-one corrective exercise techniques. 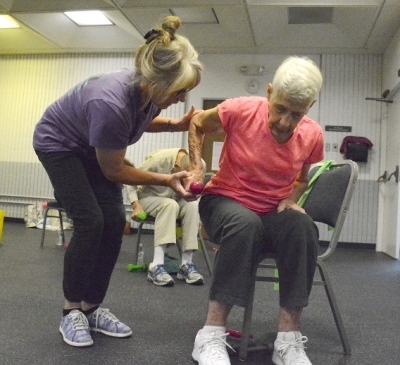 As an added bonus, a module for balance training and gait exercises is included as part of the fall prevention training. This online home study course is designed so that you can learn at your own pace from any computer or device -- whether it be at your home or office or even your cell phone. You are not required to complete the entire 4-hour course all at one time. You are welcome to log back in and start where you left off, or you can repeat the entire online course again during the 90 day activation period. There are no tests required for this course. When you have finished all the training modules, you will be able to download and print your Certificate of Completion. Immediate online access will be given within 24 hours of receiving your payment. You will be emailed your login and password instructions to the email address you had on file at the time you placed your order. You will have three months from the date of purchase to complete your training. Online Course Cancellation Policy: Registration for all online courses is final. No cancellation or refund is available since access is granted to online courses immediately after a purchase has been processed. All course materials are copyrighted and cannot be copied, downloaded or distributed. Online Course Acceptance: The buyer of this course agrees to keep their user name and password confidential at all times and also agrees to not share their user name or password with others. This is a non-accredited personal enrichment course that is open to the public. No prior experience, training, licensure or certification is required in order to learn the content.